With posts on France, wine and art this week, the perfect movie was easy to choose. It’s a classic that I’m sure many of you have seen and if not, I’m thrilled to introduce you. 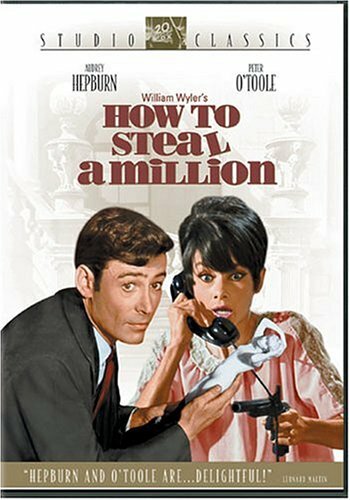 How to Steal a Million is a frothy romantic comedy that shows Audrey at her best – charming, stylish and disarming. 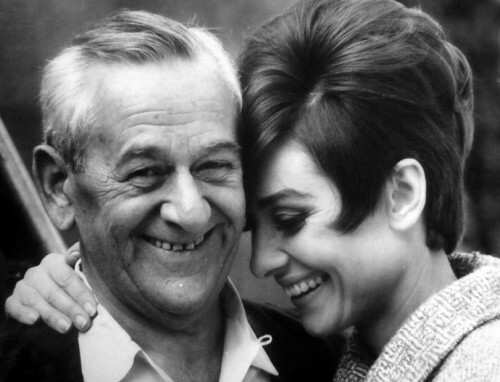 William Wyler, above, directed her brilliantly in this, their third feature together, after Roman Holiday and The Children’s Hour. 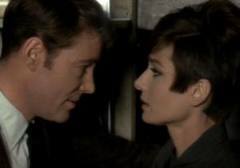 From 1966, this is widely considered Hepburn’s last role as a female ingenue, her next picture being Wait Until Dark – which was quite a departure. 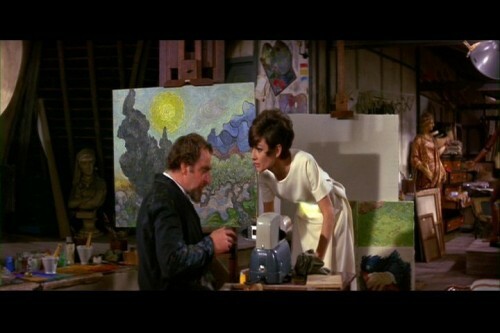 Hepburn plays Nicole Bonnet, the daughter of Charles Bonnet (played marvelously by Hugh Griffith and his crazy eyebrows) a wealthy art collector who just happens to also be a forger. Things have gone swimmingly until he decides to donate his fake Cellini Venus statue to a museum, which proceeds to announce plans to have an art specialist examine the piece. Hepburn realizes the only solution is to steal the statue, which is supposedly worth a million dollars – hence the title. This movie has everything going for it. First is the fabulous location. 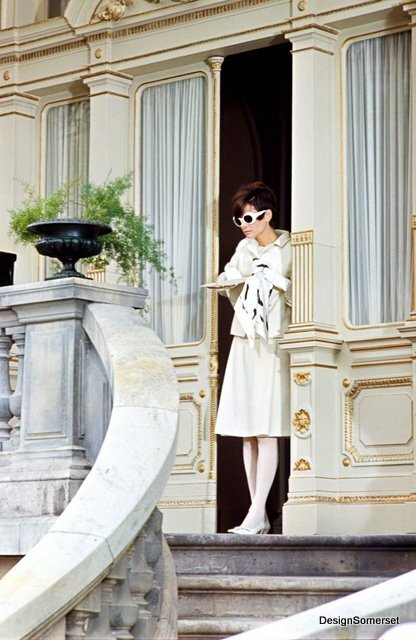 It takes place all over fashionable Paris, from the Bonnet’s fabulous home to the Ritz. Then there is the wardrobe. Givenchy designed an incredible array of fun and fashionable outfits for this movie, some even a bit campy and over the top. 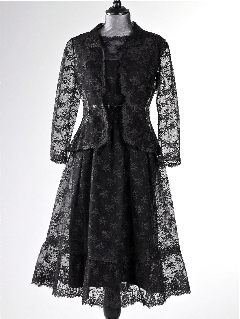 One of the dresses, a Chantilly lace outfit Hepburn wore in the famous scene at the Ritz bar, was eventually sold at auction for £60,000. 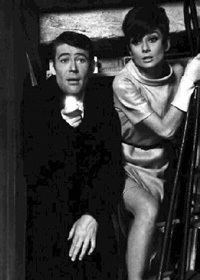 Not only was this Hepburn’s last comedy, but it was the first time she had a leading man about her age. 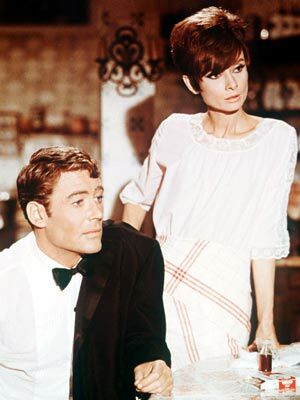 Peter O’Toole is devastingly charming as Simon Dermott, a burgler she catches trying to steal a painting from her house, and then later recruits to steal back the Cellini. His debonair charm and piercing blue eyes make him hard to resist and their on screen chemistry is sizzling. The witty repartee makes their pairing a total delight, and two hours effortlessly zip by. With a supporting cast of Eli Wallach and Charles Boyer, this wonderfully chic caper film from the 60s oozes with vintage appeal and will provide wonderful escapist pleasure for all those who indulge. And don’t be surprised if you find yourself pausing the movie to look closer at an outfit, fabulous interior or view of Paris. This entry posted in entertainment, film. 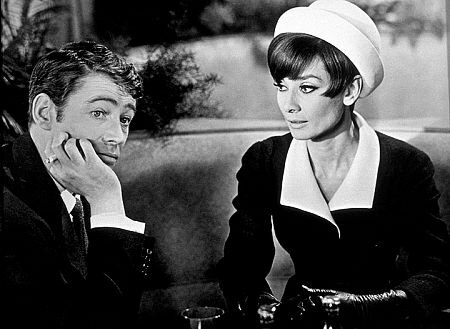 Entry Tags: Givenchy For Audrey Hepburn, How To Steal A Million, Peter O'Toole, Romantic Comedies Bookmark the permalink. I. Love. Her. It’s as simple as that! Makes me smile just to think of this movie…thanks for the reminder! I’ve not seen this movie all the way through yet…only bits and pieces…so thank you for reminding me of it, now I know what to rent next! 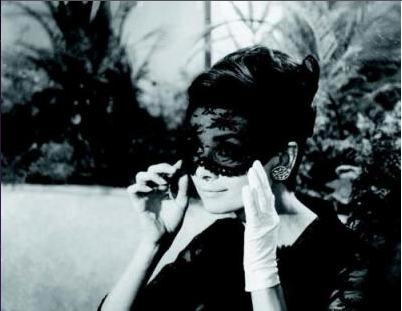 oh, and hepburn, a perennial favorite…. You chose welll wtih all thte chatter about France and beautiful french things! She is always going to be such a memorable iconic figure and its so nice to see that she is still remembered so fondly by so many. I saw this movie years ago (my mom loved it) but I think I may just have to track one day and watch it again especially since I am already longing to go back to France. Merci beaucoup! Just the perfect movie to watch after a day at the NY Gift Show – with the boys upstate skiing this weekend I may just have to put this on my Netflix for tomorrow… Thanks for the wonderful suggestion (as always!) Happy weekend, Q! I remember seeing this as a preteen in the theater and loving the interiors. What a great pick! Adding this to my Netflix account as soon as I can! Thanks! I love your taste in movies–as it is identical to mine! Thanks for reminding me of this utterly delightful and charming flick. Such a fun film! My Audrey library is on VHS and our old player finally gave out… time to get some DVDs! Been a while since I watched this fabulous movie, so I will try to find it. Hope that you have a wonderful weekend, q.
wow…so beautiful and stylish images although I’ve not seen this movie…have a great weekend! I love classic movies. I had the opportunity of trying on one of Audrey Hepburn’s dresses last year, it gaped by about 5 inches at the waist, she was so tiny. I’m in, oh how I’m in! I feel lilke I’ve seen it but only because the character names all sound familiar, not the plot. Possibly I was very young. As a child, I couldn’t wait for Saturday morning cartoons to be over and the old black/white movies to begin. I love love love Audrey. 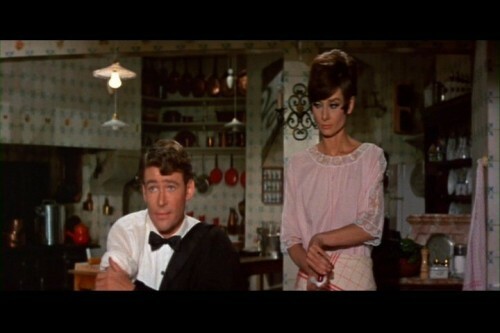 I remember going to see My Fair Lady in Boston they were playing old classics in an old movie theater. It was incrediable on the big screen. Of course, Roman Holiday and Sabrina are a few of my favorite old time movies along with Pocketful of Miracles with Betty Davis as Apple Annie as must see…and a few others. But I cannot remember if I saw this one – I saw most of her movies. I will need to order it off netflix as a pleasant reminder. Stacey: I agree, I love that movie and haven’t seen it in awhile. OMG I wish you hadn’t seen that photo. I am dying!! I’m scrolling down to visit some of your other posts. Can you believe I went a week with no wireless? It was awful, except I was probably more social than usual. Surprisingly enough I haven’t seen this movie yet, not sure how that happened. Adding it to our “snowed in yet again” lineup for the weekend! Q, as always the perfect suggestion. Her outfits in this movie are so stupendous. 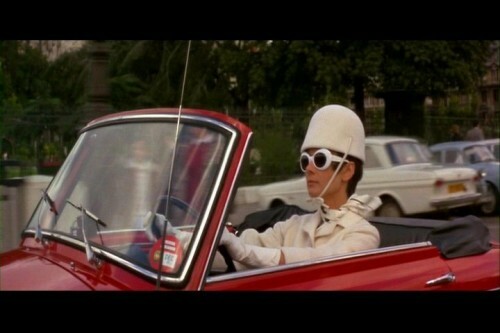 The car scene which you featured is, of course, quintessential of the film’s style. I’m going to watch it tonight! Have a great white weekend. Wow, did you pick a good one. In fact, I’m thinking of adding it to the Netflix lineup, the spousal unit has not yet seen it. I forgot about the lace dress being auctioned, talk about beautiful… it was stunning. I haven’t seen this movie in ages! I love all the “stills” you find. Being able to examine little details that you missed or forgot, such as the white hat and sunglasses she is wearing the red car! It’s a favorite…need to watch again for the style. Happy weekend!! Hi Barbara – I love him too! Have a great weekend. 83 queries in 0.588 seconds.